Jypyä Pop (Turku, Finland) on 2 April 2013 in Art & Design and Portfolio. 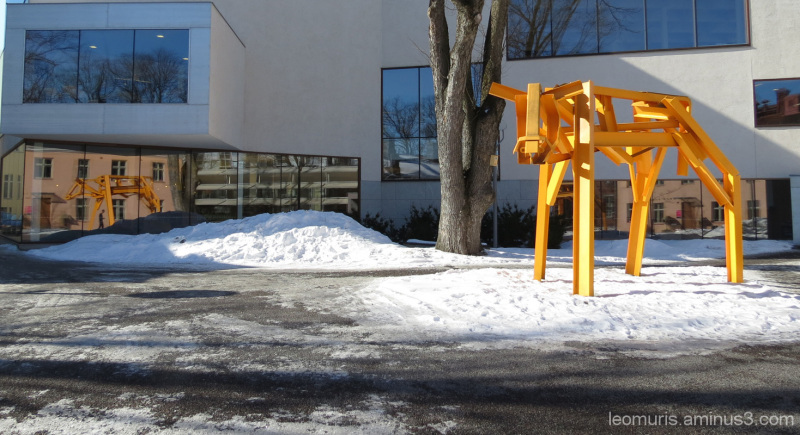 This cow is standing in the yard in Turku City Library. I have heard that it is a high-quality art. Oh, and of course, I want to wish a lot of fun st.
so beautiful frame, colors, lights & reflections! Haaaaaaaa oui très bien vu!!!!!! The most odd thing about it is that it is recognizable . . definitely a giraffe ! @Ronnie 2¢: Luckily for us, might have not see this comment. He has meant a cow. The artist is well-known Finnish bred cows, a friend of Mrs. Miina Äkkijyrkkä. Oh...A metallic cow ...!! Great composition . Happy ST ! Haha very quirky indeed. Stands out well in the snow too! @Ainsley: Finnish cow is an iron animal. wow... what an artistic work !!!!???? Great shot. Great colour, reflection and light. My shot of this same piece of art is here. Excellent point of view to see its lovely color and shape. A wonderful ST image! @Patrick M.: This "cow" was a reflection of the reason why I took this picture. A cool cow and nice reflection. Ooh yes , great shot with the reflection.